All kids need to be encouraged to participate in physical activity and sports to maintain a health and wellbeing. A family caravan or camping trip is the perfect way to get kids away from screens and engaging in outdoor activities. A study conducted by Natural England found that children spend 60 per cent less time out and about than their parents did at the same age, and even less time in the outdoors. The evidence is linking this shift in activities to growing childhood obesity levels, and a growing disconnect with nature. Sadly, the same study found that a staggering 91 per cent of kids say that spending time in the outdoors with their parents would make them happy. And 79 per cent of kids who have never camped say that they would like to! So, maybe it’s time for a family camping trip in the upcoming school holidays? I get to explore new places. I can get muddy and dirty and don’t get into trouble. I learn about new things in nature. I get to do new and fun things. I get to do things with my family that I don’t do at home. Kids who have camped before are significantly more likely than kids who have never camped to have flown a kite, climbed a tree, made a cubby house outside, explored a pond with a net or cooked on a camp fire. Inspiring kids to get active like this is increasingly important in today’s era of digital entertainment. Getting the whole family off the couch and out into nature can only be a good thing. Plan for the car trip and make sure that the kids know what to expect. Provide them with entertainment for car rides, stop for regular breaks to alleviate restlessness, and get them engaged in the trip with games like spotting certain cars or reading road signs. Involve kids in setting up camp with simple tasks like putting out tables and chairs, and finding out where the facilities are, such as amenity blocks, camp kitchens and playgrounds. Small camp chores will also help to keep them engaged in the experience. You’ll need to pack a lot more clothing than kids would use at home because they’ll be out getting dirty (hopefully!). Also, make sure that you have packed colouring activities, board games and cards in case you get a rainy day. Plan family activities, such as explorative day hikes and nighttime adventures with torches. Kids will love being in charge of their own backpacks with all the necessities, such as water, snacks, a torch and sunscreen. All kids need to be encouraged to get off the couch these days, and a healthy, active lifestyle can also help to prevent and manage certain cases of diabetes. Check out the Diabetes Australia website for a host of resources and information. And with school holidays not far off, visit the Let’s Go Caravan and Camping website for camping inspiration and the useful caravan holiday park finder. 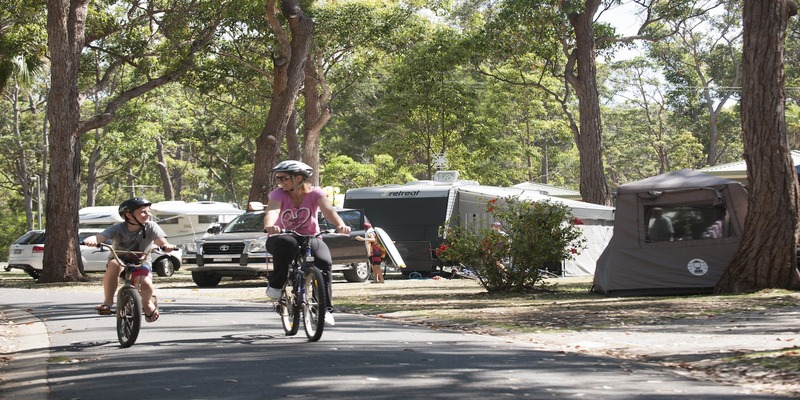 The Caravan Industry Association of Australia is a charity partner of Diabetes Australia.